It's a very bad day for Samsung, found guilty of everything that Apple threw at them. I'm sure an appeal is already underway. That's it. I give up on the world. It is simply too stupid for me to live in. I'm not surprised by the trade dress victory at all. When even Google warned Samsung, something wasn't right. 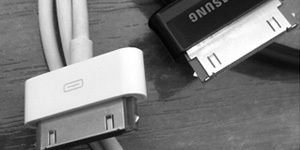 The photo on the post shows a bit of it, why on earth would Samsung need to clone a proprietary 30 pin cable? The software patents are going to depend on one's opponion of the system overall. And I personally think reform is needed. The bounce back patent is one that I do think is a shame that no one else can easily make use of. I pretty much expected this outcome though. My first Android phone was a Samsung Captivate, and it was very obvious where Samsung was getting inspiration from with TouchWiz. The unfortunate part is that it was a half hearted copy even, leading to a worse experience then stock Google Android at the time. Prior to Apple, Samsung's copying is pretty clear too. Slides from the case that Samsung presented showed a number of other phones that copied various Blackberries, Trios, and HP iPaq devices. My hope for Samsung at this point is that they take this as a hard learned lesson that they need to be original with their devices. Don't run off and follow trends, make your own and help diversify the marketplace with real choice. Not shoddy knockoff choices that don't work as well as the original. My problem with this is that from the year 2000 BC to 2007 AD, copying has been a basic and accepted part of human culture worldwide. Every stapler has basically the same form. Every microwave, refrigerator, shirt, coffee mug, television, telephone, computer, car, house, and the list goes on. All made by any number of different manufacturers. Suddenly, Apple has given the world such an inconceivable mind job that ordinary humans now see the basic principle of building devices that look like the competition to be morally wrong. Not only is it historically what we've always done, and not only is it not morally wrong, but it is ideal from a capitalistic consumer perspective. It lets us flood the market with similar products which users already know how to use, and which lets them make informed choices about purchases and switch brands easily. It stops monopolies from forming. This decision marks the end of the generic product, and creates a world where products must be original to be legal. It sounds good to say "everybody must be different," but if you actually think about it, it is a terrible idea. The issue isn't with copying. It's how the copying is done and what is in place to protect investments. It takes a lot of research, work, and time to come up with something new, even if it's an iterative product. Patents (who's idea dates back to the Greeks, well before 2007 AD ;) exist to help protect the cost of that research, and to encourage people or companies to explore and experiment. There are definitely flaws with the modern patent systems in many countries, but I don't see the solution being one of which the entire, nearly 2500 year old concept needs to be scrapped. There is a balance that can be met to ensure a healthy competitive market which also encourages risk to bring new things. Many of your examples have their own patents, which are licensed all the time. Refrigerators are a great example of proper copying, and where a high amount of patent licensing occurs. The initial patents for them used some pretty dangerous chemicals. If all the companies sat around and just copied that one patent without improvement, we'd still have deaths occurring in homes due to leaks. A few companies though decided to invest in a better method, discovered freon, and were granted a patent on the newer system allowing them to recoup the cost of that research and make available a safer device. To me, there is a difference between just blindly copying something to the point of trying to ride the coattails of a different product, and copying to improve and provide real differentiation and proper choice in the marketplace. If everyone blindly copied the Ford Model T car, we'd have a very bland car market. Instead, companies come up with many different engine designs, bodies, and capabilities for their vehicles allowing for proper choice when one needs a personal vehicle. And I'll re ask my question regarding the Samsung case, what purpose does copying a proprietary 30 pin connector serve when the cables themselves aren't actually interchangeable? It seems to me it was simply to confuse and provide no added benefit. If Samsung wanted a proprietary cable to have some extra accessory income, they had plenty of other ways to do this without cloning a competitors cable. I don't want to get into the specifics of patents, because I am legally not allowed to. One of the most fucked up things about the patent system is that you can be charged triple damages if you are shown to knowingly infringe, so companies tell their employees they are not allowed to read or discuss specific patents. How are we supposed to innovate if only the lawyers, and not the engineers, are allowed to know what the competition is up to? In general, why would a company make some interface to their product similar to a competitors? Simple: consistency. Users don't need to re-learn the system. The problem with your argument is that you're saying companies should innovate, and they should, but the patent system and companies that abuse it are forcing their victims to innovate in every single aspect. You're essentially saying that Samsung must not merely produce a phone that is different to Apple's in some respect, but rather in every respect. Such a rule is insane -- if followed, it would mean that every device in a category would be completely different. I think you really need to have a good think before you start trumpeting out the "but Apple did a lot of research and that investment needs to be protected" argument. I buy that argument for certain key inventions, like maybe the telephone itself. But do you actually believe that an "invention" like swipe to unlock took years worth of dedicated research, and is therefore worthy of a twenty year monopoly? You speak about there needing to be a balance, yet you defend the most obvious extreme abuses of the clearly unbalanced patent system. My main point here isn't to specifically defend Apple (as they have many well paid lawyers that seemed to do that job just fine.) It is to defend the idea of patents though. I don't personally agree with the length of the current tech patents, since the space is moving so quickly. But yes, I do believe aspects of what is being done in the tech space need protection of some sort. A more balanced approach in my mind would be where key usage patents which allow a more consistent experience must be licensed at a fair rate. And yes, the willful infringement aspect is a weird situation these days, clearly a case where lawyers ran with something for far too long. Ideally, engineers would be looking at patents frequently, to find ways to improve things. Similar to how OSS encourages more eyes to see the system and help find areas of improvement. It's easy in the Samsung vs Apple case to pick one thing, such as slide to unlock and wield it as a club as part of the discussion. But it's a bad way to go about it, due to not seeing the forest for the trees. I still see the overall issue as one being that Samsung willfully copied Apple in many areas, but did a poor job of it which worsening their own products. This is bad for the ecosystem as a whole. People may get frustrated with something that doesn't work quite right, and assign that blame not to the individual device, but the category as a whole. Want an example of this? Think about the damage to computing as a whole Windows managed to do with it's bad reliability. One too many trips to a local computer tech to fix a software issue has kept many away from the power of computers. 2. "Companies should be forced to innovate, for the benefit of consumers." This argument is part of statement #1. You are saying that Samsung should be more innovative. Fair enough. I can agree with that. Innovation is great. But you are using this as a pro-patent argument. You aren't saying "Samsung should be more innovative so that they can make better products." You are saying "Samsung should be punished for not innovating." That is ludicrous. Innovation is good, but why should I be forced to innovate, on penalty of sales embargoes and billion dollar fines? Also, you say: "People may get frustrated with something that doesn't work quite right, and assign that blame not to the individual device, but the category as a whole. Want an example of this? Think about the damage to computing as a whole Windows managed to do with it's bad reliability." Invalid example. I agree that this is the case, but Windows was/is a monopoly. If you have a monopoly product that is bad, then it will result in a general blame of the product category. If you have a non-monopoly product that is bad, then people will simply buy the alternative. You cannot honestly say that people are going to look at a poor quality Android device, and then decide not to buy an iPad because they think that all tablets must be like that? It is far more likely to be the other way around (since iPads are in a dominant position in the market). By the same token, if I buy a cheap Bic pen and it doesn't write half the time, I am not going to come to the conclusion that all pens are flaky; I'll just buy a different brand next time. I apologize, as there is a lot of misunderstanding going on here. I'm not trying to say companies must be forced to innovate by some regulatory force. The free market will provide plenty of pressure to innovate on it's own. Samsung could have just sat back and continued to sell the phones they made years ago, with nothing new. Eventually the market would move on and Samsung would either have to deal with losing a position in that market, or change to meet newer consumer demands. The reason I say Samsung's copying is bad for the ecosystem is similar to the cheap knockoffs that some shady manufacturers crank out. Engadget calls them Kirf (Keeping it real fake). The Kirf devices simply exist to lure unsuspecting people in, playing on confusion by making it seem similar enough to the real device on the surface. Take for example this Playstation Kirf: http://technabob.com/blog/2011/06/25/game-station-p1-4000/ I would expect a manufacturer like Samsung to be above this practice. Again, the reason I'm disappointed with Samsung in this case is because they willfully copied Apple, did a poor job, and tried to sell their device as just as good as an iPhone (vs selling it on it's own strengths). Their own attempts to copy made the device worse compared to just using stock Google Android. This does a disservice not only to the smartphone ecosystem, but also to Android. Samsung may not damage a persons impression of the smartphone ecosystem, but it does have a higher potential to damage people's impressions of Android. I say this from direct experience of not only my personal Galaxy S device, but also from friends who had similar experiences, some with no iPhone history at all. I try not to be a fanboy of one side, and overall I do want Android to get better to provide better competition in the marketplace. I personally own devices that run various systems, to be able to judge for myself and see the differences and similarities. Outside of Android (of which I currently have a Nexus 7), I also have a WebOS tablet, and owned a Windows Phone 7 for a few months. Okay, well I haven't used a Samsung device, so I'll have to take your word for it. But in that case, your argument has nothing to do with patents whatsoever. You may be disappointed that it was trying to be similar to the iPhone, and didn't meet the mark. I'm just happy that there is competition in the market -- and a relatively open platform. This patent verdict kills competition. If you want Android to provide competition, you had better be against Apple's lawsuits, because they aren't helping anyone (including Apple fans, who are now going to have to pay an even higher premium for the products that are now able to move towards a monopoly position). These patent and trade dress lawsuits happen all the time, in all sorts of industries. The Apple vs Samsung one made for a big news story. Most of the other ones never even get a mention in the back pages of most newspapers. I also don't see how this patent verdict kills competition. It's a ruling against Samsung only, and only against some of their devices in the US, not all. The fine (even if it ends up being tripled due to willful infringement) is not large enough to put Samsung out of business. I say this based on history. Nokia's successful suit against Apple didn't put Apple out of the race. Google/Motorola's attempt to sue over standards essentials patents hasn't put Microsoft out of business or even dented their XBox 360 marketshare. There is no legal precedent here, beyond the existing (in need of reform) patent system is working as it has for the past several years. The system is sadly stacked against allowing a smaller player into the field. This isn't a threat posed by only Apple though. Google/Motorola holds a number of key patents to making a phone, as does Nokia, Samsung and plenty of other companies. Only other large companies can bear to deal with the current system, risk bringing a new product out, then possibly take a hit or two when a few small lawsuits fly over patent infringement, partially due to the previously mentioned policy forbidding engineers from even looking. I do wish there was more push to properly reform the patent system. And in that regard, I'm disappointed in pretty much every tech company for not pushing for change, including Google who claims to be open and against patents. Real change isn't going to occur by talking about it. It's going to happen when companies and people stand up and make it happen. Until then, companies are going to continue to work within the existing legal frameworks to stay in business and protect their interests. This includes Apple who will continue to patent their work and designs to allow them to continue to survive, and Google/Motorola who also has many active patent lawsuits to protect their position.